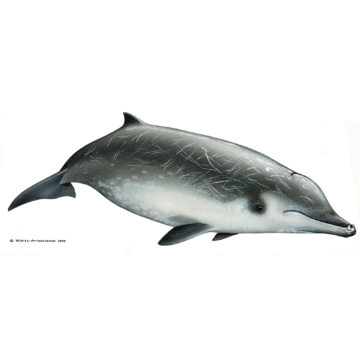 True’s beaked whales are known to reach lengths of up to 5.4m and weights up to 1400kg. Newborns are probably about 2m long. Life span is unknown for this species. This species is characterized by a spindle-shaped body, with a small head, small dorsal fin located about two-thirds of the way back from the snout tip, small and narrow flippers and un-notched flukes. The forehead transitions into a moderately short beak, with a straight or slightly curved mouthline. The melon tends to be rounded and prominent. The overall colour pattern is one of basic countershading, with a light belly and darker sides and back. There is generally a dark ring around the eye. 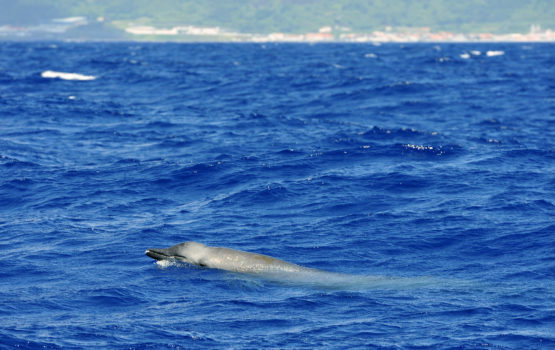 These animals usually show little scarring compared to the other beaked whales observed in the Azores. True’s beaked whales are characterized by the position of the mandibular teeth at the very tip of the lower jaw. The small tusks are visible outside the closed mouth of adult males. They may show their beaks when surfacing. Like other members of the genus, stranded animals stomach contents include mostly squid but may also take fish occasionally. Since True’s beaked whales have rarely been identified in the wild until recently, there isn’t much information available about the social structure of this species. Groups observed at sea vary between 3-6 individuals. The distribution of this species in the North Atlantic seems to be in temperate waters. At sea, True’s beaked whales are difficult to distinguish from other mesoplodonts that share their range. In the Azores it may be almost impossible to distinguish them from Gervais’ beaked whales if no adult males are present. Probably sightings of this species have occurred earlier, however the Espaço Talassa team has only started to recognise this species since 2016. Most of the sightings of beaked whales occur in the summer season, between early June and late August.